On the surface, it looks pretty much the same, but today marks a key day in the Wall Street Journal’s assault on the NYT. I had to hunt for it in my neck of the woods, but I finally managed to snag a copy of the paper this morning. 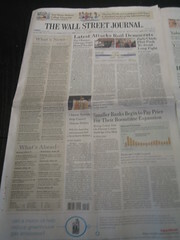 The changes are editorial, so it looks like just the old Wall Street Journal. Ostensibly the front section is now more of a catch-all for general news, though it’s hard to point to one specific thing and know that it wouldn’t have been there on Friday. As this note explains, the real difference is in the opinion section: It has a new look and more content. And today features the debut column from ex-publisher L. Gordon Crovitz, which will be featured every Monday. You can see a picture of it here. Regular readers of the print edition may do a better job identifying how the look has changed. I was excited too this morning for this "redesign" but it seems to be more of a content strategy shift than a redesign. I guess us web people are used to seeing redesigns focusing on adding new features and products to the same words and pictures. This "redesign" seems more about new words and pictures.